For many families, August is the ideal time to plan a getaway or an event that brings everyone together. Summer weather is at its peak and there is a desire to do something fun before the kids start school. Ephraim Shores Resort, a family resort by Peninsula State Park, is the ideal headquarters for your family’s plans. With its spacious rooms, indoor pool, exercise room, game room and large outdoor space, including a jungle gym, and a private sundeck overlooking Eagle Harbor, Ephraim Shores Resort has everything families look for when choosing a place to stay or finding a location for a family reunion. Located in the heart of Ephraim, the resort offers rooms of various sizes, including two-bedroom suites with a kitchenette. Nearby Peninsula State Park has plenty of activities to keep your family busy. You can swim or hang out on the park’s beach, take a hike on one of the park’s many trails, ride a bike on the park’s groomed trails, visit a historic lighthouse or explore the park from the water in your kayak. At night, Northern Sky Theater actors perform plays outdoors under the stars. Beyond Peninsula Park, Door County has plenty of activities to keep everyone busy, including shopping, golfing, winery tours and boat tours. When planning for your family get-together, having enough space is vital. At Ephraim Shores, a family resort by Peninsula State Park, you can choose from a variety of room sizes and enjoy the resort’s many amenities. The resort also has ample green space outside where you can gather with family members to relax while the kids play on the nearby swing set. Guests can also use the resort’s bikes to pedal around the village. 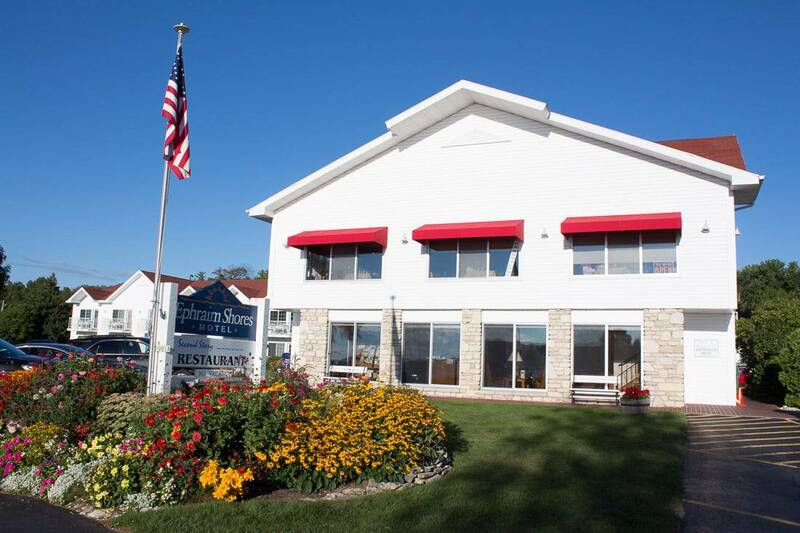 As a downtown Ephraim resort, we are in walking or biking distance to restaurants, shops and the marina.